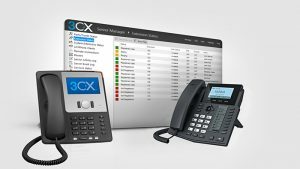 Our team of experts here at CyTechnology utilises the popular, award-winning 3CX IP telephone system, a mature software-based Private Branch Exchange (PBX) for Windows, which works with IP Phones, Session Initiation Protocol (SIP) trunks and Gateways. This way, businesses not only benefit from reduced costs on maintenance, line rental, and call charges overall, however avail from enhanced relations with their customers and, ultimately, boosts overall customer satisfaction. The 3CX IP telephone system also offers plug and play capabilities on its powerful softphones thus granting mobility through the Internet rather than on traditional PBX phone systems, which are well-suited for Mac, Windows, iOS and Android platforms. This offers you the options to connect into the network and conduct your business calls through your softphone or even through your smartphone, home desktop, and laptop via your office extension. All of these options will help reduce mobile costs while increasing employee productivity and mobility…at no extra cost!